Transformers Generation 2 was in many ways a transitional line of toys. It began with several bright recolors of older toys and ended with some of the most well-designed Transformers that are still being re-released in subsequent lines. Back then, things like light piping and ball joints were high concept in a world of robots toys that couldn't even bend their knees. The deluxe set of Dreadwing and Smokescreen are two of these prolific Transformers that are some of the best transforming robots you can find. 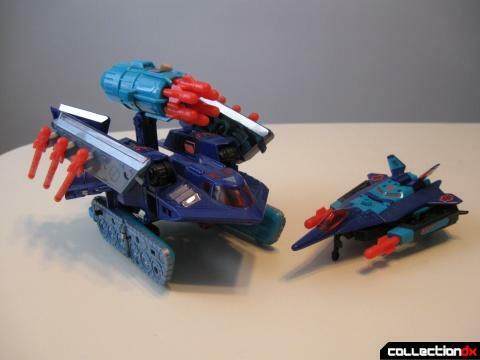 If this set was said to have one defining aspect, it would be missiles and the myriad of things it can do with them. 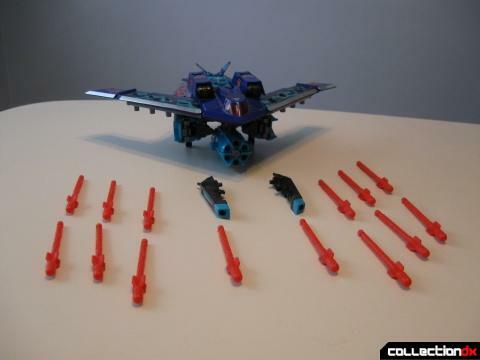 This set comes with a total of 14 missiles that can be mounted all over the toy making Dreadwing and Smokescreen some of the most "heavily armed" toys out there. From this angle you can get a sense of the toy's aesthetic. 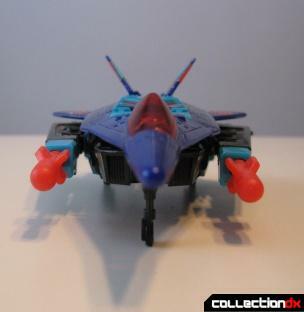 While Generation 2 is known for its excessive use of garish neon, Dreadwing comes off as looking quite menacing with his combination of dark blue and turquoise with clear red highlights. Even the strange black and turquoise camouflage doesn't look out of place. Each red oval on the wing is a button that releases the underwing missiles like bombs. 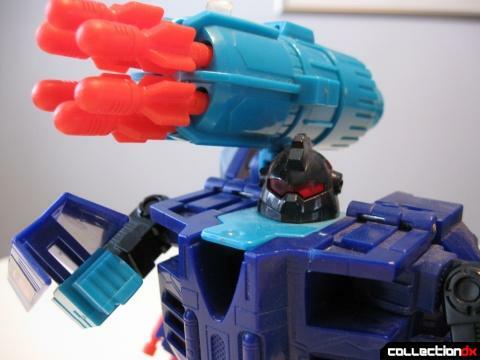 The six shot Gatling gun fires each missile in a clockwise rotation when you rotate the back part of the gun. From the front you can see how Dreadwing rests atop his landing gear. 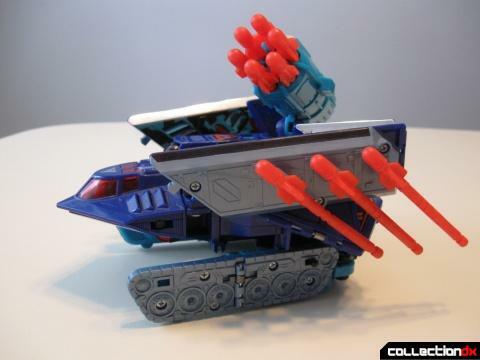 The Gatling gun serves as the nose wheel but does not contain any actual wheels to allow the toy to roll. One unfortunate problem with the gun is that the missiles do not lock in before firing, so they tend to slide out if the gun is not level. 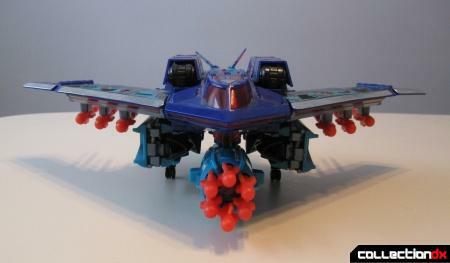 From the rear, you can see how Smokescreen fits into the back of Dreadwing. 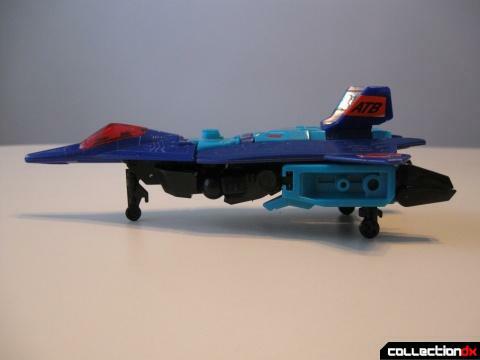 By locking Smokescreen into the slot, he rests over a trigger that keeps Dreadwing's wings locked in place. When you remove Smokescreen, the wings spring up. Now that the two toys are separated, Dreadwing can assume his tank mode. To complete the tank mode, the tips of his wings are folded up and the Gatling gun is rotated up to form Dreadwing's main weapon. Pushing a button on the back of Dreadwing's legs will unfold them into the tank treads. Dreadwing is not the most convincing tank, but the Gatling is easier to use in this mode. He rolls on four plastic wheels. Two of which are simply the folded up landing wheels. In robot mode, Dreadwing exudes that weighty bulk that makes him look like a mean machine. Now that gatling gun is shoulder mounted, Dreadwing becomes a little backheavy and can topple if his feet aren't firmly planted down. Dreadwing's head features a light piping gimmick for his eyes. The red eyes is a nice effect. If you look close you can see where I had to repair his chest. While some may dismiss Smokescreen as just a second banana to Dreadwing, he's a fine toy in his own right. From the front you can see how he rests atop a full set of landing gear. Sadly the wheels do not turn. 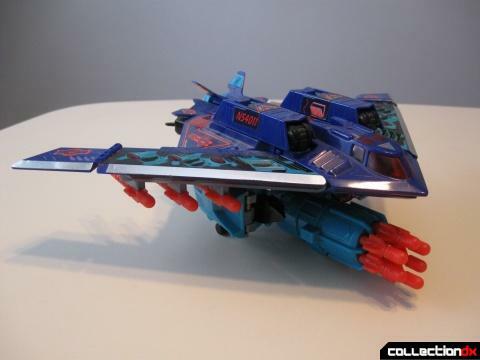 Probably one of the most endearing traits of Smokescreen is that he's one of the few Transformers jets that looks sleek. His design is an amalgamation of the F-16XL, F-22, and X-15 combined with a rather Macross-esque transformation. This is not an official transformation. Smokescreen is a very limber looking robot. Unlike Dreadwing, he locks together very well in robot mode and has a good amount of articulation. 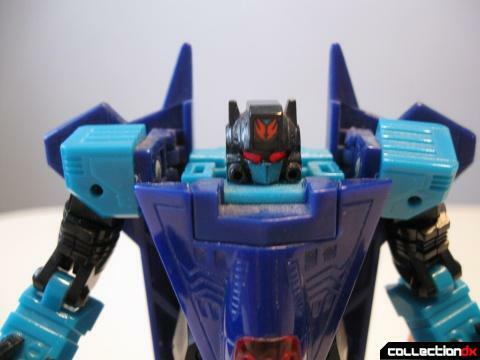 Here is a closeup of Smokescreen's face. The light piping gimmick also works very well with his head design. 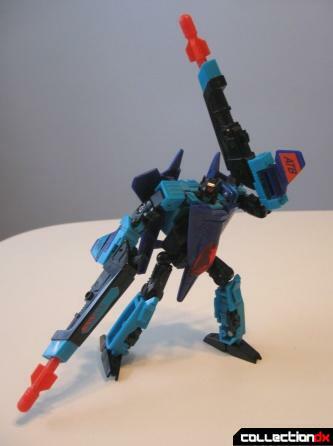 The twin missile launchers can be mounted in Smokescreen's hands or on his legs. They're from a era when Transformers could shoot your eye out. Each launcher can fire a missile a good four or five feet. Overall, Dreadwing and Smokescreen are a real gem of a set. The individual robots are well executed and the combined mode looks great as well. 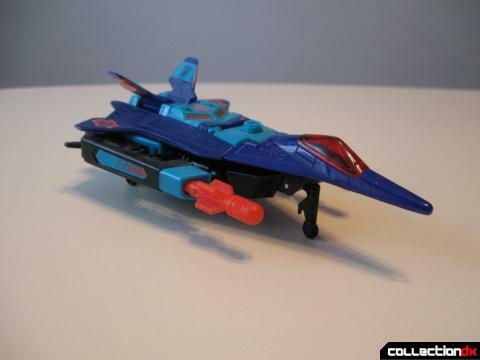 Although this set is over 15 years old now, Dreadwing and Smokescreen have been re-released several times. They became BB and Starscream in Beast Wars II, Dreadwing and Smokejumper in Robots in Disguise, and Gigant Bomb and Smokesniper in Robot Masters. In any form, these guys are a must have for Transformers fans. this is great. a transformer review that isnt of the newest most recent release. Hats off to you sir.. 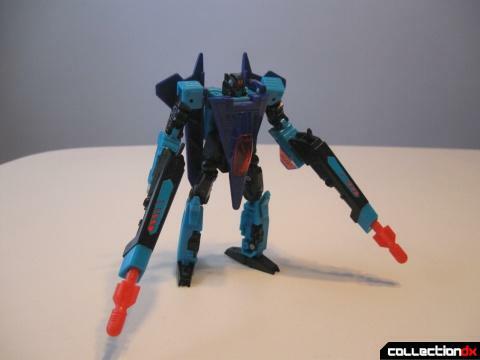 I unfortunatly dont own this version, i have the Dreadwing and Smokejumper set. I like the more... "realistic"? colours that go with the set. but i also love anything generation 2. GEN2 bruticus anyone.. awesome.. these two unfortunatly, just aint in the budget at the moment. ever notice how smokescreen's face freakishly resembles prime? This was one set I always kinda wanted but never got. 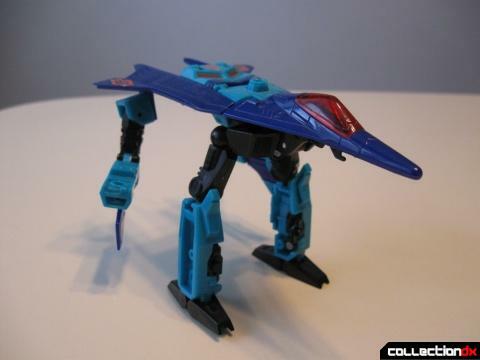 the RID version looks the best to me, followed by this one. BTW Did you know that the BW II version was based on an unreleased version that was to released at the end of G2 as Megatron and Starscream? Rare packaged examples exist oddly (like how there were package examples for the unreleased Stunticons and Protectobots). Nice review, I admit :) I'm a G2 Lover myself, unfortunately, my Dreadwing and Smokescreen are a bit busted and can't find any spare parts and ammo for them. Cool. I pretty much hate Transformers, but I like the vehicle mode of this and it's massive amount of weaponry. Makes me think of MASK or something like that. Nice review! How could you hate Transformers? I'm not asking you in an "internets flame war" way,I'm just genuinely curious.I'm not saying every TF is pure gold,but I don't see how someone who likes the kind of stuff covered by CDX wouldn't be at least somewhat fond of them. Most of them just look like crap to my eyes. And not in a charming or funky way. Add a rabid fanbase to the mix and I just find the whole phenomenom annoying. I feel the same way about Macross, too. If lived in Japan, I'd probably hate Gundam. Not a big TF fan. 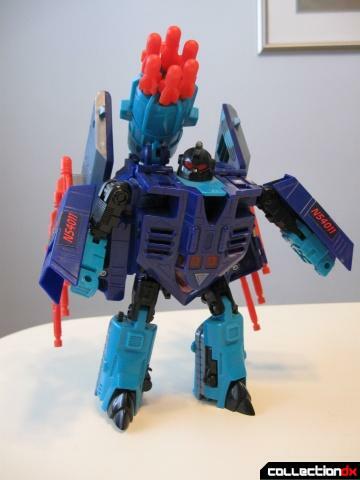 But was the Smokescreen mold reworked into Energon Starscream? I though he looked familiar... While I don't own either figure, it does look quite similar. 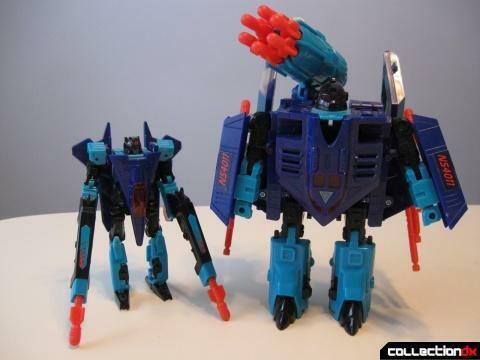 The transformations are similar, but Energon Starscream is actually a bit larger. To answer your question. 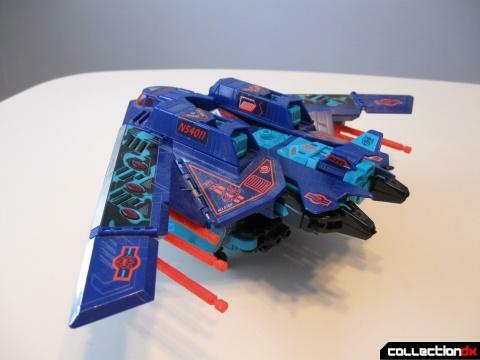 No, Energon Starscream wasn't refurbished from G2 Smokescream. He's purely an original mold design that was inspired from the G2 Decepticon Jet. I'm sure about it. Coming into Transformers just as G2 was ending, I only got a handful of the figures, and these were my first trademarked-Transformers. No comic books, no video games. I vaguely recall there being a cartoon, but only really remember that the bookends during the episodes featured a CGI Prime transforming and shooting. Nowadays, I only know that G2 was an opportunity to bring back G1 toys in new coloring, and bring forward new designs like tank-Megatron and usher in the era of "safe" toy Transformers. How is G2 connected to G1 story-wise other than through toy lines and certain characters, if at all? Is it a continuation? A retelling? Does it ignore/add factors from G1? TV show was the Transformers show with crappy CG transitions and borders added. The G2 comic was a continuation of the original Marvel comic. The toys more or less coincide with the comic version. So... G1 and G2 are the same story? I thought there were differences? It depends on the media... G2 TV series is just a recut version of the first two seasons of the original 'G1' cartoon. The G2 comic books are alot different, and I've always thought, kinda stupid. The comics were very early 90's 'edgy' and 'extreme' with graffiti on the robots and extra missiles and guns just strapped on all over. So, then, when I do my story & character summaries, what should I put down? The G1 story? Again, the G2 comic story is a continuation of the G1 comic. It's post-Unicron, the main Decepticon army is defeated, the Autobots have dispersed and turned into a few ragtag guerilla warfare teams and they find there's a second generation of Decepticons that left Cybertron while Optimus and Megatron were offline on the Ark for 4 million years. These new Decepticons are a vast empire conquering countless worlds and "cyberforming" them -- turning them from organic planets to metal ones. Optimus and Megatron are still there (Cobra from GI Joe built Megatron his tank body), Grimlock's around, Megatron resurrects Starscream and they kill Bludgeon and take over the original Decepticons, the new Decepticon empire guy is Jhiaxus. Those are pretty much the main characters. You may want to read some summaries on the internet or something. Yes, I got the gist of the summaries that I have already read online. I just wanted to know if G2 took place in an alternate universe like all later series did or not, since it was mostly in comic book-form and they were recycling the footage from the G1 TV series. Sorry. Perhaps it's a bad habit from being a Trekker- I'm of the opinion that if something doesn't appear on-screen, then it isn't canon. And since G2 was off-screen for the most part... you get the idea. Oh, yeah, the Transformers comic and TV show are totally separate continuities. Sorry if I wasn't clearer on that! Good, good. Now I can proceed. Now I know I can't simply copy/paste what I used before; I have to create something from scratch.